2 Rolls 20mm X100ft Heat Resistant Tape - PAMISO Heat Press Tape Sublimation Tape - for Heat Transfer Vinyl,3D Printers High Temperature Tape by PAMISO at In The National Interest. MPN: PR000156. Hurry! Limited time offer. Offer valid only while supplies last. Specifications: One-side Self-adhesive Size: 20mm(wideth)x100ft Heat Resistance: 280C Package Contents: Material: durable polyimide and silicone. Material: durable polyimide and silicone. 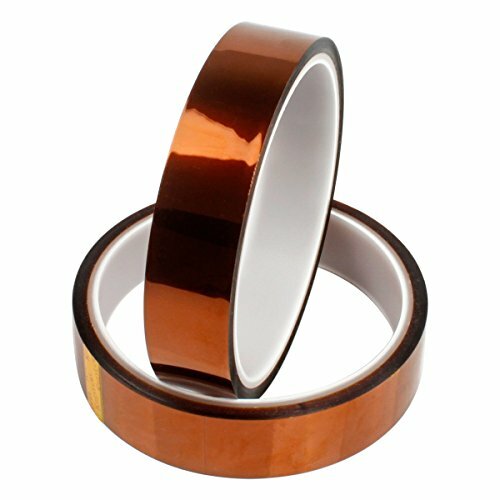 ☆Extensive use as heat tape for transformer, motor, coil, capacitor and frequency conversion power supply in electronic industry. ☆Transfer tape for vinyl.This heat transfer tape keep your design in place when you making shirts and hats,help to do heat transfer vinyl on a heat press. If you have any questions about this product by PAMISO, contact us by completing and submitting the form below. If you are looking for a specif part number, please include it with your message.